Joan, your process of focusing on parts of a design and taking it winging off from their (sometimes wildly) is exactly what I do. I dislike copying enormously because being creative is my reason to stamp. But I also don't feel very original or unique, and when I try to be original, everything comes out looking boring. Your results here are STUNNING! 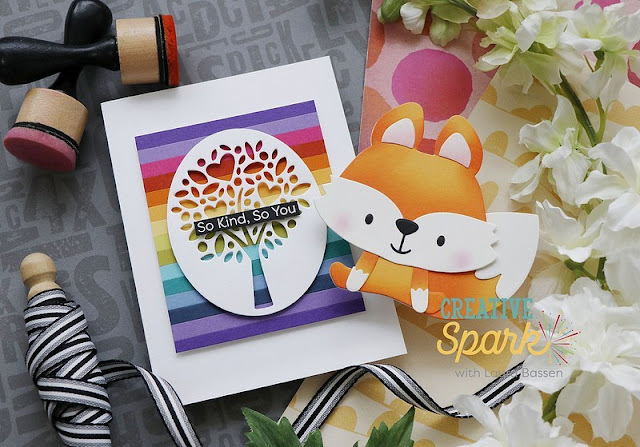 Beautiful inspiration card, and beautiful inspired card! I'm sorry you didn't get picked up for the trial. darn that first sentence. "winging off from their CHOICES..."
I’m so sorry to hear that you aren’t able to participate in the clinical trial. I’m sure volunteering will be it’s own kind of adventure! And the card-making lessons are fabulous! your rainbow hydrangea is brilliant!! love it!! and so sorry to hear about the clinical trial - you'll have to let us know about the volunteer activity. have a good rest of the week. You have blown me away with this card. Absolutely lovely! I am learning so much from your learning process. How disappointing for you to have been rejected for the trial drug - I'm sorry to hear that. Love this Joan & I can totally relate to being inspired and maybe even start to copy a project but in the end it looks totally different by evolution which is awesome & wonderful & you should continue this journey of exploration, emulation & evolution!! Look at me sounding all smarty pants when I’m totally winging it most of the tim! Gorgeous, who would have thought a rainbow hued hydrangea would look so fabulous. Love this. Stop the presses! I'll never look at a hydrangea the same again. Honestly, this is then most beautiful, fun, original hydrangea I've ever seen. Inspired, but certainly not copied. You've hit on something, Joan. LOVE it! I'm sorry you were so disappointed about the clinical trial. They're pretty strict about those. Sometimes I think I'd like to stamp all day and I love it when I have the chance, but I have to get out and about, too. I hope your volunteer opportunity works out. Such a pretty card, Joan. If it was me, I would have copied directly :). Of course, you can stamp all day! Well, I LOVE this card! Your imagination and execution were perfectly in sync. Perhaps the most helpful thing I've learned from your process (and obviously mine as well) is that I am not the designer. I need other inspiration to enjoy my craft. 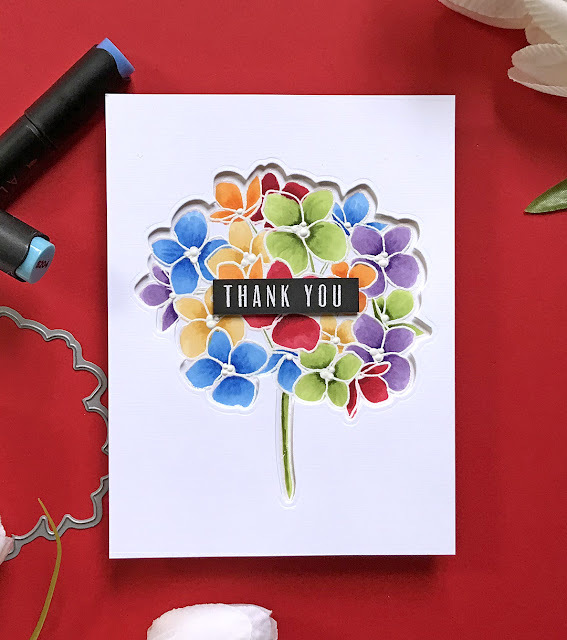 While my cards are often a more direct interpretation of the inspiration card, I am ready to take a new approach to card-making that receives the inspiration for what it really is and use my own creativity to bring it new life in paper and glue. You are an excellent mentor for me. thank you! J.B. I HAD to stop over to get up close and personal with this fan-TAB-ulous Hydrangea!! I'm tellin' ya, I'm gob-smacked by it! I may have done a rainbow daisy once, but never did I ever think to use this set - but I will now! Thank you for sharing your inspired journey - hey, even Norman Rockwell painted from a photograph! so why can't we all try on a few of our favorite designer's styles for size, right? I may try a little J.B. today, if you don't mind! Beautiful card Joan! Love the rainbow colors and restamping/embossing technique. Joan, this series of studying/learning and sharing is spot on! While I've always loved your original painted cards best, the 'inspired by' cards are remarkable and your writing always makes me grin 😄 So sorry about missing out on the trial, your efforts to get in were great. Hugs, and here's to lessons learned and stamping all day! I am learning so much through your series and experiments!!! I have saved enough inspiration photos for a lifetime of own "studies". I am rethinking my "inspiration" process to recognize what I like about the examples, and plan to group them that way so its not 3,000 individual sources but more like a dozen themes like rainbow colors or backgrounds from small stamps. I also need to act on that inspiration, instead of spending all day online collecting it by seeing what others are making rather than making some myself ;-) That is a topic for another day though! Your card is gorgeous! I love it. This is the one I'll use for inspiration. Thank you.